A Questions forum is set up to allow members to ask the community for help on any given topic. Ask a Question, and wait for Answers. Answers can be rated by up-voting or down-voting them. Answers with higher ratings appear at the top. This allows other members to participate by up-voting Answers they believe are correct or helpful. The "Best Answer" feature allows others to quickly see that your question has been answered satisfactorily and will allow other Questions to take higher priority in the Help & Support forum. Please mark the "Best Answer" when you no longer need help with the issue. If you have sorted out your own issue please let us know by posting your own Answer and marking it as 'Best Answer'. 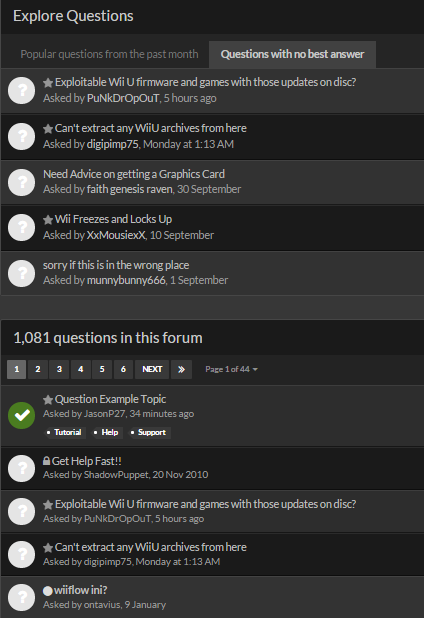 The Questions forum displays a list of topics like any other forum, however it's slightly different in that it will show by default Questions with No "Best Answer" (or Popular Questions) at the top of the forum, and below will show by last post date as normal.